Excellent customer service and professional installation of our new 2 stage Lennox furnace. Everyone from the initial phone call to the knowledgeable sales dept. 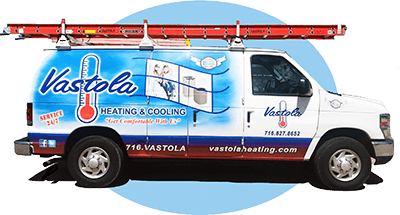 to the installers were all very ... ~ Chris D.
Since 1946, Vastola Heating & Cooling has provided expert heating and air conditioning service to customers in Erie County, NY and the surrounding areas. We’re a family-owned business that is licensed, bonded, and insured. While serving the region, we have achieved an A+ rating with the Better Business Bureau and we work hard to maintain it. Our technicians are also NATE Certified. As a result, you can be confident that you will be receiving quality heating and air conditioning service when you choose us. At Vastola Heating & Cooling, we make every effort to assist residents and businesses in Erie County with their heating challenges. Our heating service involves system analysis and diagnosis, along with recommendations for solutions. After recommending the best solution for your problem and getting your approval, we’ll work quickly to fix the issue. Our trained technicians are experts at installing top brands like Carrier, Generac, Lennox, Mitsubishi, Rheem, and Rinnai. They’re not limited to just that though, they can work on any make or model. The heating units we offer are both energy-efficient and cost-effective. Our installation team will take precise measurements to ensure proper installation so that you can enjoy your new furnace without interruption. We accept both small and large repair requests, so call now! Summers in Erie County, NY and the surrounding areas can get hot. That’s why we offer speedy and top-quality air conditioning services. Our technicians will come to your home or business to diagnose your air conditioner’s problem and work with you to come to the best solution. We know that the quality of the air in your home or office is important. That’s why we’ll do our best to fix any problem as fast as possible at a price that works for you. If you need a complete home energy assessment or want to sign up for a maintenance plan, we can arrange for one of our technicians to meet with you. We also service and install generators, which can help you stay comfortable even when the power is out. Your satisfaction is important to us, and that’s why we strive to complete every repair or installation job with efficiency. You don’t have to wait a long time when you contact Vastola Heating & Cooling in Erie County. We provide 24-hour emergency repair service, so you never have to be without heat or air. Our flexible service payment options and discounts also make our company one of the best options to choose for heating and air conditioning repair in the Orchard Park and the surrounding areas. Call today to schedule a visit from one of our technicians!